While it is still too early to know the exact reasons for this setback, one factor seems to be emerging: in the United States, the shale oil “revolution” seems to be on the verge of imploding. 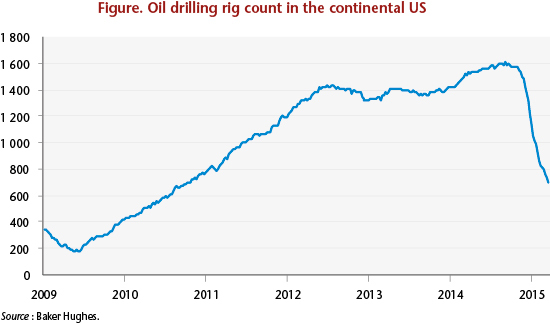 The sharp fall in crude prices in the second half of 2014 caused a collapse in mining activity: the number of oil rigs operating in the US fell by 56% from November 2014 to April 2015, returning to the level of October 2010 (see chart). The speed of this downturn underscores the fragility of the shale oil boom and its dependence on high oil prices. Given the very short lifetime of shale oil wells, i.e. less than 2 years, the sharp decline in the pace of drilling should result in an equally rapid decline in production in the coming months: in fact, for the month of May the US Energy Information Agency (US EIA) has forecast that shale oil production will fall for the first time since the start-up of operations in 2010. This rapid contraction of the shale oil industry could have significant consequences for the US economy. There are two main components to the macroeconomic impact this will have: the business of drilling and completing wells, and the gains in the trade balance from substituting domestic production for imported oil. In 2013, the hydrocarbons mining industry and mining-related services accounted for 2.1% of the US economy, up from 1.6% four years earlier. At a first order, a decline in the drilling rate could therefore cut US growth by 0.3 GDP point. The Fed’s manufacturing indicator already shows just such a decline: American industrial output is down by 1% on an annual basis in first quarter 2015, a first since the second quarter of 2009. The mining sector seems to be the leading contributor to this decline, with activity falling off by 4% during the quarter. However, this figure neglects the ripple effect from the sector onto the rest of the economy – which goes beyond the impact simply on upstream industries: for example, in the regions affected, shale oil operations were accompanied by a real estate boom generated by the influx of workers into the shale fields. Texas and North Dakota, for example, which concentrate 90% of the total production of shale oil, contributed over 23% of US growth from 2010 to 2013, whereas they accounted for only 8% of the economy in 2010. The negative impact of the collapse of the oil industry could thus be more important than the size of the oil sector alone might suggest. The rise in US production of over 4 million barrels per day in 2014 also led to an improvement in the trade balance, contributing an additional 0.7 GDP point to growth. If the reduction in the number of wells is followed by an equivalent decrease in production starting in the second half-year, and oil prices stay at around USD 60, US domestic production would now contribute only about 0.2 GDP point, half a percentage point less than in 2014. Finally, the rapid exploitation of shale oil deposits was mainly due to the so-called independent producers who specialized in this activity, and who are therefore particularly vulnerable to the volatility in international prices. This is a very capital-intensive activity: the independents made use of bonded debt to finance their operations – for a total of USD 285 billion as of 1 March 2015, including USD 119 billion in high-yield bonds. The impact of the fall in oil prices has been particularly important for this last segment: the share of “junk bonds” rose from 1.6% in March 2014 to 42% in March 2015, i.e. 50 billion dollars. It should be noted that this increase has resulted mainly from the deterioration of existing bonds, even though new bond issues have also contributed. If this trend continues, it could lead to a crisis in the high-yield segment of the US bond market, which would hurt US corporate financing conditions this year at a time when the Fed wishes to begin to tighten monetary policy. The implosion of the shale oil industry will test the strength of the recovery in the US: if it turns out to be weaker than expected, the shock of the sharp slowdown in the production of shale oil could be enough to bring the American economy to near stagnation in 2015. Yozzo & Carroll, 2015, “The New Energy Crisis: Too Much of a Good Thing (Debt, That Is)”, American Bankruptcy Institute Journal. ← Does Price Stability entail Financial Stability?